Three things I wish I could bottle for later: summer sunshine, the restorative powers of vacation sleep, and the energy of a child. Probably in that order. I crave sunlight. I love sleep. And with every passing year, it takes more energy than I naturally have to carry me through the day. I don’t want the constant energy of a child. I’m not really a high energy person. I just want to bottle their non-caffeinated all natural enthusiasm so I can partake of little sips when this dilapated body needs some. An infusion of kid energy combined with the wisdom of years of experience would possibly enable me to complete everything that my caffeine-hyped morning self put on my to-do list. Yesterday, three grandkids paid a brief visit while desperate momma bought groceries. In anticipation of their visit, I stopped my activities early to put my feet up with an iced Kahlua coffee and a couple of non-pareils. (French note: non-pareil means “no equal” and I’m telling you there is no equal to one or two quality dark-chocolate non-pareils with a tall iced coffee laced with a splash of Kahlua.) Life got even better when hubby walked in early from work. Back-up. See, the eleven-year-old has two speeds: hypnotic, technology-induced coma and hyper-adrenaline laced activity, which usually involves adult supervision and/or tickets to a theme park, but can be temporarily assuaged with a fidget spinner. Prior to PopPop’s arrival his choice of activity was going to be a new book I bought. He actually flipped through it and grunted tentative approval. Actual reading will likely require a sleep-over which he not so subtly hinted at. But PopPop introduced a new level of engagement: driving lessons on the zero-turn mower. Do you want to see a fidget spinning kid toss aside the fidget spinner? Put him on a piece of heavy machinery and let him drive. He was in seventh heaven. The trick will be to channel his enthusiasm into mowing all the grass. I’m pretty sure money will be involved. The kid is a mercenary when it comes to money. Meanwhile, his three (and a half!) year old sister watched from the screen porch, dying to drive the kiddie tractor. There was no way I was letting her out in the yard to get run over by her brother, so she had to content herself with non-stop storytelling to her captive audience (me) while 17 month old brother busied himself removing everything from the kitchen cabinets. His favorites: the salad spinner and crab mallets. Lucky for me he didn’t use the crab mallets on the salad spinner. Big brother eventually heeded sister’s sporadic cries to “Stop! Please stop! Stop now!” Her interest in driving the battery-powered kiddie tractor lasted about three nanoseconds. Since we were now all outside and little brother was investigating the human-powered toddler tractor, I took the talkative one over to the Big Hill so she could practice rolling down it. Once upon a long time, her mother and aunts sledded down this hill (her mom sledding right into a tree that is no longer there). Now on a glorious sunny afternoon, the hill is cushy with thick zoysia grass. I get her lined up perpendicular to the hill (she expected to “roll” with her feet facing downward as for sledding), I tuck her arms in, and cry, “Go!” Silly me expected her to roll like a log down the hill. That’s how one rolls, right? In a sort of straight line, maybe veering off to the left or right? No. This girl meanders down the hill like a child going from Point A to Point B in “Family Circus.” It’s sort of a cross between a roll and a crab walk, limbs flapping and body flopping all over the hill in any direction but down. I’m not going to tell her it’s wrong because she is delighted. And if I tell her how to do it “better” I will have to demonstrate. I am half tempted because the day is just that nice, but the fact that my knee is in a compression bandage from getting awkwardly into a car keeps my enthusiasm in check. But oh, to have the energy of a kid! I would sail through a teaching day with a three (and a half!) year old’s energy and delight! I could tackle the biggest projects if I had the enthusiasm of an eleven year old on a zero-turn. And my kitchen cabinets would look great if I tackled them with the reckless abandon of a toddler. Add a splash of summer sun and some stored up slumber, I could take on winter. Well, that’s not going to happen. The best I can do is store up memories. Consider it done. Little Emily loves the Japanese maple in the Maywood yard. It’s over fifty years old, planted by Emily’s great-great grandmother Retta. And it is the perfect tree for little ones to learn to climb on. The main trunk divides into two very low to the ground, so little legs can easily climb into it. The next branch is a short leg swing above that, providing a perfect spot for a three year old to sit and ponder. Of course, the natural thing to ponder is how to get up higher in the tree. “Help me up,” she says. “I want to go up there,” she says, pointing to a branch that is over my head and absolutely impossible for me to reach. I can’t put her there. The only way to get there is for her to climb there herself. “But I want to go up there,” she says. If you think that three year old Emily thought about it and climbed up to the high branch, you will be wrong. 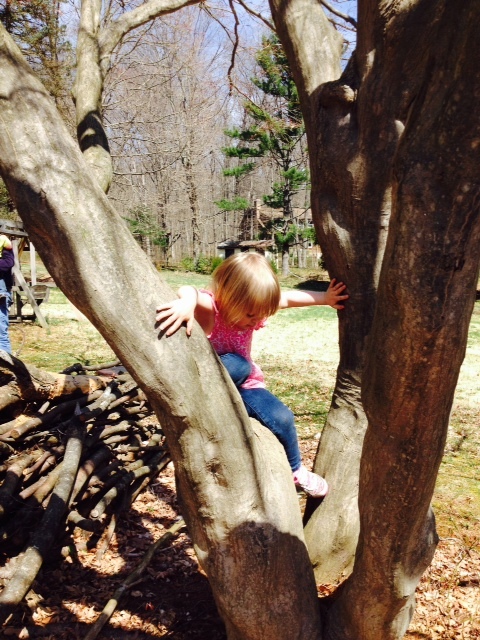 I turned around to watch out for her little brother and–that quick–she fell out of the tree. Boom. Right onto her elbow on a stick. Instant adult panic that she could have broken her arm on my watch while the parents were away. Instinctive reaction to protect her, take her away from the dangerous tree and go back to the house for a popsicle. That’s when she amazed me. She got up, surprised but not crying, and she climbed right back into the tree. This time she had real respect for the tree. She carefully considered where to place each foot, how to hold on. Her goal was no longer how to get up to that very high branch. Her new goal was to master the distance from the ground to that first branch. And she did. While I diligently spotted her. Oh, the Winnie-the-Pooh lessons to be learned from Emily and The Tree. On the way to school Monday, I thought of how I wanted my students to be more like courageous Emily. They tend to want me to implant knowledge in their brains, like Emily wanting me to put her on the higher branch. However, they panic when things are difficult, fear making mistakes, and want to bail on the whole learning process when it doesn’t go as quickly as they want. They also absolutely, positively do not focus on anything for longer than a nano-second. “I want to tell you a story,” I began first period class. So I told them about Emily. Um, yes. And then I told them what branch they were currently on and how we were going to climb today to a higher branch. That seemed to calm them down. Apparently they believe that learning will kill them. Friday, my colleagues and I attended a workshop on Teaching the 21st Century Learner. The speaker was good and had extensive handouts of his very scripted presentation that covered all the usual blah-blah about active learning, none of which I can recall without reading the handouts. His presentation did not teach me nearly as much as I learned from little Emily. Students want to climb high. Students have to do the climbing themselves. Students learn from their mistakes. Students need diligent coaching and spotting while they climb. I’m tempted to assign tree-climbing for homework, but they would fall from their trees, injure themselves so they couldn’t participate on their sports teams, and I would get blamed for such a stupid idea. I guess instead I’ll focus on how to better coach and spot them. They do want to climb, and I don’t want them hurt on my watch. Yes, I did. I took my 8 year old grandson to a Peep Show. I can’t think of a better way to spend Easter Monday. 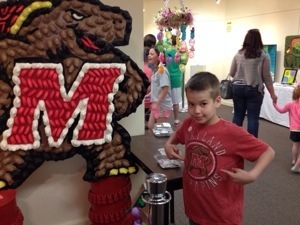 Two floors of the Carroll Arts Center in Westminster were devoted to creations made of marshmallow Peeps. 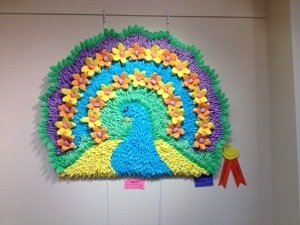 Entrance to the show was free but we bought ballots to vote for our favorite creations. 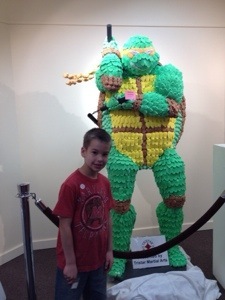 Life size Teenage Mutant Ninja Peep Michelangelo, submitted by Tristar Martial Arts, was my guy’s favorite. 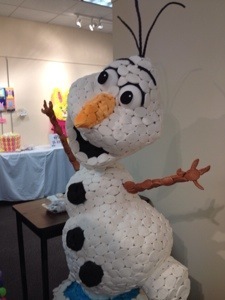 It also took first place as the audience favorite with 2807 votes and won the Sponsor’s Award from Just Born, Inc., the makers of Peeps. 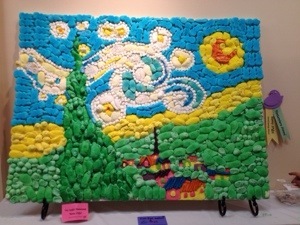 I was impressed with a replica of VanGogh’s Starry Night by Carroll Springs School, which won the Masterpiece Award. A Peepcock was pretty sweet too. It came in third place with a popular vote of 1790 and also won the Director’s Award. In the theatre we sat down with some popcorn to watch a reel peep show…videos starring Peeps. 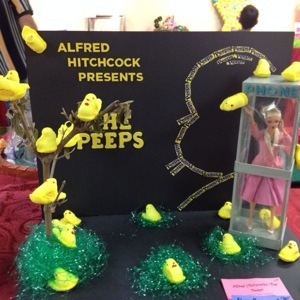 Some videos featured live actors encountering Peeps. Others starred Peeps encountering live humans. In one horror clip the Mama Peep answered her door and got eaten by a human head! Another little film, voted the Best PEEP Film, called Peep War 2014 involved a peep-eating turtle. I’m not too sure why the film starred a plastic turtle, but the stop-motion scene of the turtle devouring the Peep was pretty good. The videos were clever…and very homemade. The grandkid was inspired. With visions of movie greatness in his head, the single package of yellow Peeps in Grandboy’s Easter basket was not going to suffice. We had to buy some green Peeps for his video creation. Backdrops were made. Props gathered…wood blocks, leaves, Play-Doh. Characters prepared…3 yellow Peeps and a green Creeper assembled with toothpicks from parts of green Peeps. Then the task of learning how to use the app: how long to maintain each slide, how to sync the audio with the freeze frame, how to add the “Kerpow!” We were doing some pretty cool editing, if I may say so myself. The best part was that he was doing most of it. I was…cough, cough…the technical advisor. When it was time for The Boy to go home, he had only filmed half the story. Ahhh…but we had filled an entire day. Stay tuned…if he ever gets this film finished, maybe he’ll let me post it here. How do you like your Peeps? Fresh or stale? 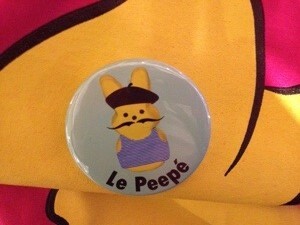 A Peep for everyone…even French teachers! 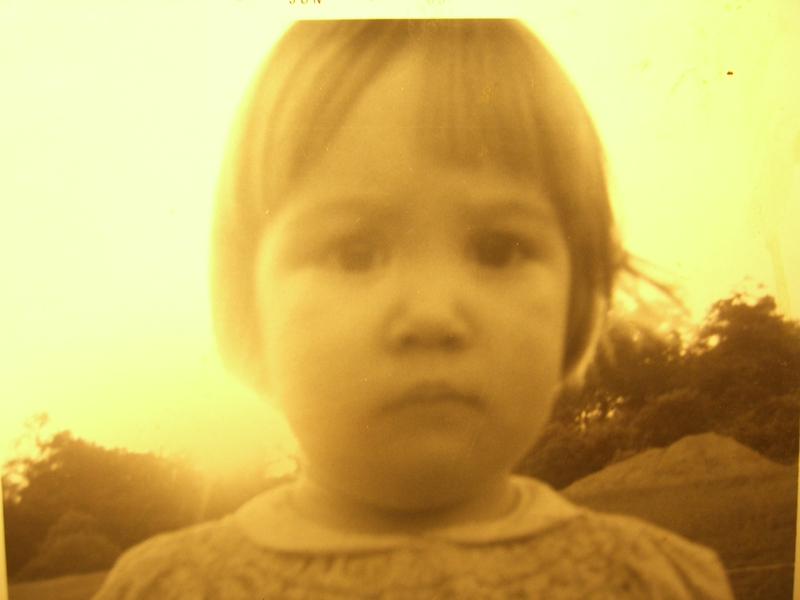 My little sister in 1969. I was too trapped in the stare-down to get a picture of the grandbabe. Grandbabe didn’t look quite as worried as little sister here, but the eyes are just as penetrating and the face is awfully familiar. I’m in a stare-down with a toddler. I lie on the sofa and she sits on my chest. She has already pulled off my glasses and she is looking at me. She’s been babbling non-stop all day but now she is silent. Looking. Deep into my eyes. She doesn’t blink. She doesn’t realize it’s a stare-down. I’m not equal to the challenge. She’s not just looking at me. She’s looking into me. I feel her searching to the depths of my soul with her big, innocent eyes. And she doesn’t blink. Her eyes may be innocent, but they cut no slack. She doesn’t blink, but I do. My eyes are burning from her intense gaze. And I can’t keep a straight face. She’s so serious. I start laughing. She still stares. “Why are you laughing?” the eyes demand. The eyes do not inquire, by the way, they demand. I’m laughing so hard now that my nose turns Rudolph red; tears leak from my eyes and stream down my face. I try to hold it in. She is just inches from my eyes. But the effort just makes me explode. Her eyes will not stop staring at me. They take in the tears and the laughter but they keep probing into my soul. “What are you doing?” the eyes demand. But she isn’t worried. She isn’t upset. She just stares at me, wordless, trying to figure me out. The more she stares, the harder I laugh. In her stare, I see her mother and her aunt and my baby sister at that age. Staring. Figuring. I recall the story of my mother sending me to my grandmother in a taxi at about that age. (It was 1957–a different era in a small town, ok?) My grandmother never wearied of telling me about my big brown eyes staring at her from the cab. This babe’s eyes are not brown, but they are big and penetrating. And in all their penetrating seriousness, they have completely melted me.